BodyFX is a long-lasting, non-invasive solution to reduce the appearance of those stubborn stored fat deposits like love handles and the dreaded muffin top, and can also reduce the unsightly appearance of cellulite. The result? Long-term improvements in your body contour, without the need for traditional incision-based surgery. How the BodyFX Treatment Works?? BodyFX is the first and only non-invasive body contouring and cellulite technology proven in peer-reviewed and published human studies to both permanently destroy body fat and contract the skin*. BodyFX addresses problematic fatty tissue in larger body areas such as the abdomen, back (flanks), and thighs. BodyFX works by using different clinically proven methods including radio-frequency energy and negative pressure applied to the skin and underlying fat. Radio-Frequency provides precise and optimal heating of the skin for tightening and body shaping. Vacuum massage applies gentle pressure allowing for maximal depth treatment. BodyFX’s A.C.E. technology works together with the above to optimize ideal heating conditions for a safe and effective treatment. 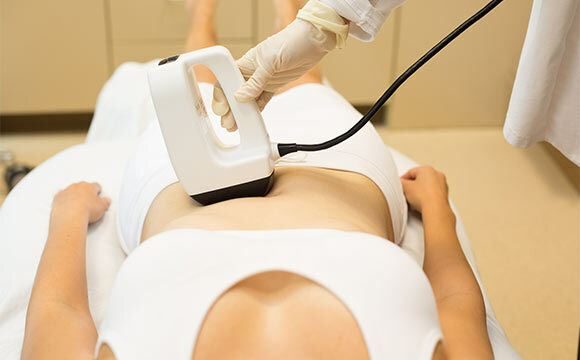 During treatment, you can expect a warming of your skin and gentle pulling sensation as the radio-frequency and vacuum work to smooth out unwanted stubborn pockets of fat, and release fat content into your body from the specific areas treated. To help flush those fat calories out of your system and avoid having them settle elsewhere, refrain from eating for two hours before and two hours after each treatment, and drink plenty of water on the day of your treatment. BodyFX is a new, long lasting, non-invasive solution which reduces the unsightly appearance of cellulite and while promoting fat reduction. BodyFX will reshape your body to provide a non-surgical alternative to liposuction. BodyFX is a perfect solution to get rid of your mummy tummy or muffin top, and improve your general body Contouring.